Over a sequence of four days at the end of March, The Truman Brewery was fuelled by a collection of 250 artisan coffee and gourmet food companies, each exhibiting their latest beans, machines, and serving techniques to industry and dedicated customers at London Coffee Festival. The first sustainability signal indicating 2019 event's environmental agenda was a broadcasted before the event, a message that encouraged visitors to bring their own cups and respect the tidal impact that single-use cups have had on the planet. At the event itself, other gestures towards the social impact of coffee were communicated by various booths using a variety of mediums - here’s an attempt to summarise them. Visual displays in the form of photographs, testimonials and graphics were used by dozens of producers, references used to indicate the humanity of farming for both producers themselves and communities at large. Fixed in sleeves at the Caravan Coffee Roasters booth, a series of postcards presented the company’s commitment to understanding provenance. Santiago Londono’s farm features, Hacienda Mallorca in Valle Del Cauca, Colombia, displayed on a postcard alongside another producer, former rose farmer Mario Hervas from El Meridiano, Ecuador. Caravan’s stationary also links the farm's connection to the tasting interests of customers, including elevation, dry style, varietal and detailed preparation and tasting notes worthy of the most discerning coffee enthusiasts. Abstracted further, 39 Steps Coffee Haus commissioned illustrator Gareth Brew to create Issue III, a series of prints that look at four of the stages in coffee production (there are 39 in total). The prints capture germination and social healthy, photosynthesis, picking, drying and parchment. Brew’s creative approach does well to isolate the separate but vital roles that environment, people and processes play in creating a good bean, beautifully framed and presented among the generally hyper-mechanised booths of the event. We already know that prisoners are 50% more likely to reoffend if they leave prison without skills and a job… As part of our mission to help the young offenders successfully reintegrate into society, we train them in professional roasting and competition-level barista skills… On their release, we also help our now ex-offenders find work using our coffee industry contacts. A tasteful A5 edition No. 5, 2018 from Allpress outlines the globally recognised brand’s emphasis on social and environmental operations, the consequence of what founder Michael (Allpress) cites as a company that will “systematically interrogate everything”. The issue features Harvest Deli from in Newrybar, New South Wales who hire a full-time forager, an interview with Kiwi Steve Rickerby, founder of We Compost, and Katrina Toovey of No. 7 Balmac, Dunedin, New Zealand whose staff been 99% responsible for keeping the business afloat while their main premise is repaired after a fire. A number of talks dug into how new-joiners to coffee can strike an upward trajectory in the industry by starting on the shop floor. As part of one “Careers in Coffee” session, a range of UK training academies were represented for a talk on the Friday afternoon. A dynamic and candid panel put forward their views and shared experiences, with speakers ranging from Sonya Wittenberg and Aashifa Hussain of Well Grounded, Edwin Harrison of Artisan Coffee School, Gwilym Davies, trainer and founder of Prufrock, Ben Szobody of Pro Baristas and Kirby Sinclair of The Roasting Party. Things went like this. Hussain of Well Grounded admitted that she wasn’t interested in coffee when she joined the training programme. Meanwhile Szobody proposed that one way to reduce the staggering 85% annual churn in specialty coffee shops is to hire different people, not “the usual suspects”, but those who would view coffee as their dream job, and an industry they wouldn’t normally have access to. Szobody and his team trains 250 baristas per year in Brighton and is welcome to the idea that not everyone will continue to work in coffee, but might at least glean insight and confidence to help them seek careers suited to them. Sinclair aligned with this, suggesting that employers and employees agreeing on trajectory and managing progression is vital for creating durable and fulfilling positions. Now based in Prague, Davies went even further in proposing that employees think like entrepreneurs and bring their own interests to the coffee world, whether that is photography, interior design or, perhaps, the alluring world of cocktails. When wrapping up, Sinclair and others agreed that a role of coffee on the high street is significant, and that the bean has a legitimate place to play in bringing people together. 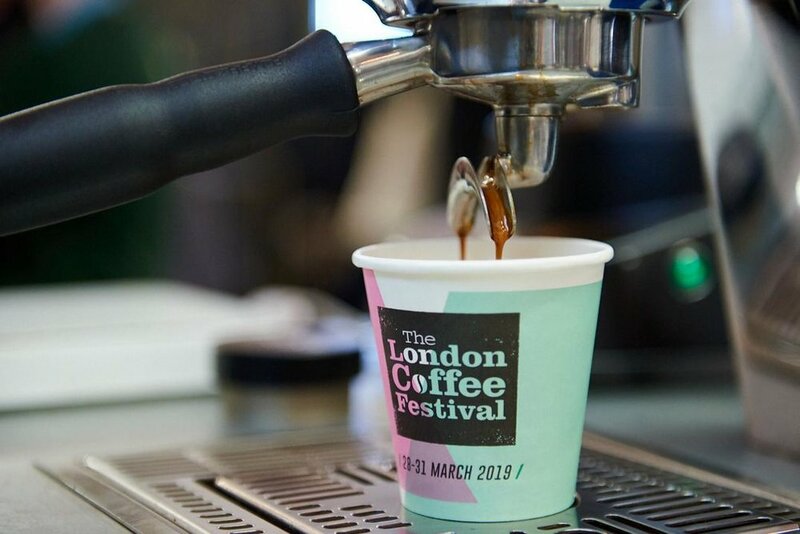 London Coffee Festival’s efforts serve to remind attendees tasting coffee on the floodplain of the Thames that the supply, distribution and waste associated with coffee is a broad network. KeepCup and Frank Green offer one cornerstone by manufacturing re-usable coffee containers, acting as part of the solution to reducing the some 500 billion disposable coffee cups produced per year. But thinking optimistically, this design thinking will also nudge consumers to look further upstream all the way to producers who live and depend on coffee that is ecologically sustainable and commercially resilient. If you come across other innovative ways that coffee world is connecting humanity in coffee, do share them with us by emailing Will Ross (will@tendo.com).